You have to be careful when using sage. The flavor can be very strong and overpower any dish so use the herb sparingly. The lemon butter dressing here compliments the flavors. 1. For the chicken breasts, place each chicken breast on a chopping board. Using a rolling pin, flatten each chicken breast until it has widened and become thinner. Season the chicken breasts with the chopped sage and black pepper. 2. Empty the flour into a large bowl. Beat the eggs with the milk in a separate bowl. Sprinkle the fresh breadcrumbs onto a plate. 3. Coat each chicken breast in the flour, shaking off any excess. Dip each floured chicken breast in the egg and milk mixture, then coat with the breadcrumbs. 4. Heat half the butter in a frying pan over a medium heat. Add two of the breaded chicken breasts and fry for 4-6 minutes on each side until the breadcrumbs are crisp and golden-brown, and the chicken breasts are cooked through. Remove from the pan and keep warm. 5. Repeat the process with the remaining 2 chicken breasts. 6. Heat the remaining butter in the frying pan in a low to medium heat. When the butter has melted, squeeze in the lemon juice and remove from the heat. 7. For the salad, mix together the olive oil and balsamic vinegar in a large bowl, until well combined. Add the rocket leaves and mix well to coat the leaves in the dressing. 8. To serve, divide the dressed rocket leaves between 4 plates. Place a chicken breast on top of each salad. 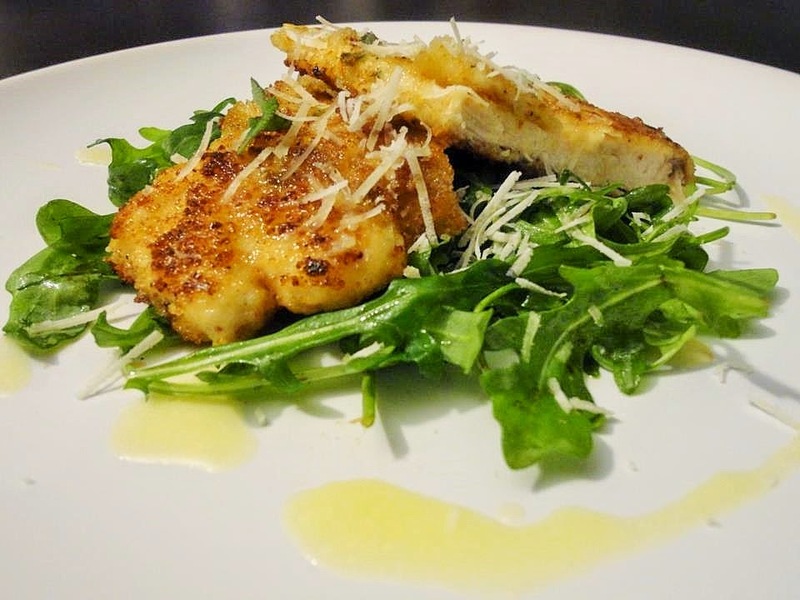 Drizzle a little of the lemon butter over each breast and sprinkle with parmesan.